The Center for Disease Control states "developmental screening is a short test to tell if a child is learning basic skills when he or she should, or if there are delays. The American Academy of Pediatrics recommends that all children be screened for developmental delays and disabilities during regular well-child doctor visits at 9 months, 18 months, and 24 or 30 months." As early childhood educators, you may implement or be asked to complete one of these screeners that can lead to early intervention. This parent-completed developmental and social-emotional screener pinpoints delays as early as possible. 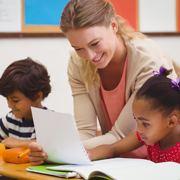 There are a number of ASQ forms to fit the early educator's needs. "DECA is a nationally normed assessment of within-child protective factors in preschool children aged two to five. It evaluates the effectiveness of individual child and program-wide interventions, provides developmentally appropriate strategies to foster resilience, effectively screens for emotional and behavioral concerns, emphasizes a team approach among professional and family members, meets programs' varying needs by allowing for flexible implementation, and meets Head Start and IDEA requirements for strength-based assessment as well as APA and NAEYC assessment guidelines." "Great Start Collaborative-Oakland and Early On Oakland, along with several community partners, are committed to ensuring that all children under the age of 5 years receive routine developmental screenings."